Slash is back! And his album's not bad, either. The top hat-toting riff generator returns with his sophomore solo album ‘Apocalyptic Love’. Ditching the string of guests used on his debut, regular collaborator and leading wailer Myles Kennedy joins for 13 tracks of polished fret craft. 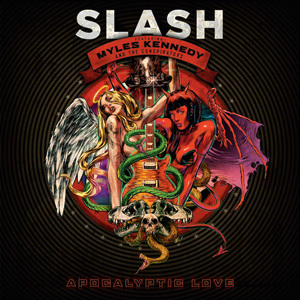 Opening strongly on title track ‘Apocalyptic Love’ the combination of Kennedy’s distinctive vocals and Slash’s trademark licks intertwine to create a strutting, hard rock belter. ‘We Will Roam’ and ‘Anastasia’ also stand out but not all songs are as successful. ‘One Last Thrill’ steals a riff from the Quo while the delicate ‘Far and Away’ fails to engage, but this remains a solid if not spectacular release from the king of wail.